By now, many B2B marketing professionals know the basics of content optimization and how to make a site search-friendly. With that complete, their focus turns to link building. While that’s an admirable pursuit, it may not yield the maximum results if unaddressed website issues aren’t resolved. Here are some of the most common mistakes we see. I’m surprised how often even large B2B companies fail to have organic landing pages on their website related to key revenue streams (e.g., product or service lines). It’s usually not that they forgot key segments of their business, but rather that they failed to get specific enough. For instance, a leasing company promotes leasing of office equipment but fails to have a page focused on copier leasing. One of the reasons for this may be that many B2B marketers have often taken a minimalist approach to site architecture, incorporating only that which is necessary to establish initial credibility. To be found for a specific keyword, there needs to be an optimized landing page on the website that revolves around that search term. Simply put, this means you need to review your business and ensure your site has at least one page that promotes each specific revenue stream. However, the complexities of B2B keyword strategy—which include the lack of shared lexicons in most B2B verticals—mean that you may have to create and incorporate several landing pages for each revenue stream. For instance, an accounting firm promoting litigation support services may have a page on expert witness services, but it may do well to also consider having a page on forensic accounting. Simply put, most B2B websites need more content, both to respond to likely organic search and to be seen as being by the search engines as an authoritative site on a given topic. If any meta descriptions have been specified in the first place, that is. It seems like B2B marketers often leave meta descriptions blank or simply leave it to the IT department to fill something in. This leads to poor descriptions in the search engine results. When B2B marketers actually specify the meta descriptions for site pages, they often write from an internal standpoint, using corporate and internal lingo that doesn’t speak to the searcher. Typically, B2C marketers are much better at writing meta descriptions that promote click-through. When you write meta descriptions for B2B, think about what will entice the searcher (your prospect) to click on your search result versus all the others on the page. While you can write as much as you want, Google will only display about 165 characters. Make sure you use those characters wisely to create a keyword-rich, compelling message. You’ve only got a few seconds before searchers decide on which results they will click. Many B2B marketers don’t bother to evaluate, let alone manage, organic landing pages. Test your organic landing pages for all significant, ranking keywords. You may rank highly in the search results for a given search phrase. You may even have a meta description that drives click-through. But is the page searchers land on the page you want them to land on? If not, optimize a different landing page or make changes to the content at the current landing page. The analytics associated with PPC landing pages are often scrutinized in great detail. Bounce rates are analyzed. Alternate landing page versions are tested. Ad copy is tweaked. Yet organic landing pages rarely see the same rigor, despite the fact that B2B purchasers tend to first look at and click on organic results almost twice as often as they do paid search results. So, dive into your analytics and do the same for your organic visitors. Isolate your organic traffic. Look at the organic landing pages. Analyze the bounce rates. Adjust landing page content. Tweak meta descriptions. You’ll be glad you did. 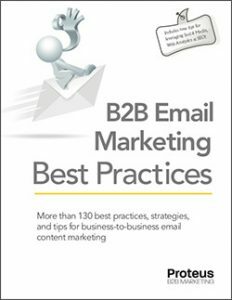 B2B marketers are frequently guilty of mindlessly posting lots of print marketing communications to their websites, often in lieu of html content. Hundreds of hours and great sums of money have been spent creating these pieces, yet most people won’t spend even an hour to optimize these pieces before posting them to the web. These often include PDFs of brochures, case studies, technical or white papers, and product and spec sheets. While these represent valuable, influential information, if you don’t optimize them, they won’t show up in the search results; the only people that will find them are those who actually visit your site. Why not make sure searchers can find them, too. Some will wonder why anyone would want to bother optimizing PDF files. Who wants to click on a PDF search result when there are plenty of html results? Well, the types of information mentioned above are some of the assets most desired by B2B purchasers. Savvy B2B searchers (and savvy B2B marketers) know that they can quickly find these rich resources using Google advance search to search for PDFs only. For more information, see this previous Search Engine Land article and also this more in-depth article on optimizing PDFs for search engines, searchers, and site visitors. B2B sites are often rife with duplicate title tags and duplicate meta descriptions. In addition to decreasing the chances that more of your site’s pages will rank well, this practice will likely lead to less of your site’s pages being indexed by the search engine. Moreover, it’s a clear sign that you haven’t optimized your site for searchers. Title tags and meta descriptions help determine whether a searcher is actually going to click on your search result. Today, there’s really no excuse for this. You can easily check for duplicate title tags and meta descriptions using Diagnostics>Content Analysis in Google Webmaster Tools. If you currently don’t use this or don’t want to wait for someone to upload a meta tag or html file (so Google can verify the site is yours), you can use Aaron Wall’s Website Health Check Tool.